There are almost as many different type of snowmobile expedition and trip as there are winter holidays, so if you fancy fitting a bit of a snowmobile experience into your holidays, it’s wise to do some research before you book anything to make sure that you get the winter break experience you’re looking for. If you really want to get into the snowmobile experience, you could make the snowmobile an integral part of your holidays, and book a long trek. For example, you could decide to take part in a six day long trek on a snowmobile across Sweden, take in the cold winter while travelling across the wilderness of Canada (and maybe even see some polar bears if you visit the Northern territories) – explore America’s Yellowstone Park, or if you’re feeling really brave and cold-resistant, why not go the whole hog and opt for one of the holidays you’ll never forget - an Arctic snowmobile tour? These snowmobile holidays are usually all-inclusive but you’ll need to check the details if you want to be on the safe side. The tour operator will usually offer accommodation along your route as well as the equipment you need to get around while you're travelling. The tours are usually organised in large groups and led by an experienced guide, which is essential if you’re going on one of the more extreme snowmobile holidays and could potentially come across a polar bear or extreme Arctic conditions. Most winter holiday resorts will offer short term snowmobile hire, but make sure that you know what you’re getting yourself into! It’s common to be able to hire all the equipment that you need from one place, so if you sign up for a day long tour through the Canadian Rockies for example, you should find that not only do you get the snowmobile, but you’ll also be given the option to hire the proper snowmobile clothing. This type of expedition is easy to find and book, and you won’t have to book much in advance because most resorts are full of places offering similar trips. 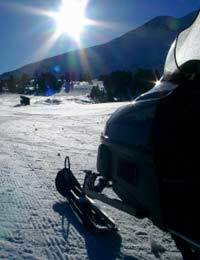 What Are the Essentials for a Snowmobile Break? Fitness: If you’re thinking of booking this type of break, a lot depends on how long you want to spend snowmobiling. If you just want to spend a day exploring the scenery, you don’t need to be especially fit, but if you’re planning longer expeditions you could find them hard going if you don’t have a good level of general fitness. Driving licence: You obviously need to be able to drive – a full UK driving licence or motorcycle licence is essential and you will not be able to take a snowmobile tour without evidence of your driving licence. Whizzing round the snow covered mountains or Arctic snow at speeds of up to 70 miles an hour can be exhilarating and great fun...so do your research and make sure that you get the most out of your snowmobile expeditions!